How did your accident occur? Was someone negligent? Was it a motor vehicle/cycle accident? Public Liability (e.g. fall from balcony, trip on footpath); work accident? Medical Negligence? Pain and Suffering, Permanent Impairment, Lost wages, out of pocket expenses, future loss of earnings, care provided by family and friends, future care, medical expenses, equipment, house modifications, future cost of medication, incontinence supplies, etc. (not an exhaustive list). 1. Are you a Personal Injuries Lawyer experienced in all areas of liability? If not, what areas? How many years have you been working in this field? 2. Where did you obtain your Bachelor of Laws? (Every State of Australia has different laws which govern different aspects of liability - so a Queensland trained Lawyers would be best). 3. 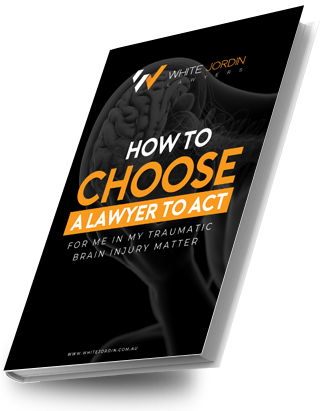 How may cases have you acted for brain injured clients in the last five years? Did those clients have a low glasgow coma score at the scene of the accident? Did the client suffer cognitive impairment? Did they have problems with behaviour and personality which effects their word capacity and personal relationships? How did you have these problems assessed? 4. Do you have a list of recommended experts who provide detailed reports for you to cover the areas of spinal injury impairment and future needs? Ask for the names? (If they can’t rattle them off immediately then perhaps they are not experienced in this field at all). Reports would need to be obtained from a Neurosurgeon, Occupational Therapist, Psychiatrist, Neuro-Psychologist. 5. Do you have a list of recommended experts who provide detailed reports for you to cover the areas of spinal injury impairment and future needs? Ask for the names? (If they can’t rattle them off immediately then perhaps they are not experienced in this field at all). Reports would need to be obtained from a Rehabilitation Physician; Urologist, Neurosurgeon, IVF specialist, Occupational Therapist (very careful who is selected as this report will cover functional assessment, future employability, equipment requirements for rest of your life, medical treatment, incontinence supplies, medication, house medications, car modifications); Physiotherapist, Psychiatrist, Neuro-Psychologist (in case of head injury as well) and in some circumstances, Orthopaedic Surgeon (depends on your injuries). 6. The Lawyer should have at least ten years’ experience in the Personal Injuries field in formulating your claim (i.e the amount of your damages will be dictated by the investigations and reports obtained in your case). If full preparation is not done, then you may be losing money that you will need for the rest of your life!! The ten years’ experience will also assist in having the legal knowledge and experience to investigate liability (whether it be taking statements for witnesses, locating other witnesses, visiting the accident site, engaging Engineers, liaising with police officers, etc.) and the negotiating skills/legal knowledge to argue the liability aspect in your favour. 7. Ask the Lawyer you meet whether he/she will be running your whole file on a day to do basis. You do not want to meet the Partner at a meeting and find that your matter is passed onto a younger inexperienced Lawyer with the Partner occasionally looking at the matter. (It is certainly fine and cost effective for junior staff to perform certain tasks but not have the overall running and control of your life). 8. Cost Agreement. Most Lawyers will look after your claim on a “no win no fee” basis. This means that unless you receive money for your damages then you do not have to pay for the Lawyer’s work. 9. However, beware, that some Lawyers will not cover the cost of medical reports or if they do may charge you interest. Some Lawyers will require you to obtain litigation loans for the cost of those medical reports/other outlays which can attract a high rate of interest until your claim for damage is settled. 10. Depending on the type of claim, i.e. Motor Vehicle Accident or Workcover, you may be able to seek assistance from the insurer to provide you with rehabilitation at their cost. Your Lawyer will need to intervene when necessary to ensure that all your needs are being met. 11. Your claim not be able to settle until your injuries are stabilised. However, your Lawyer should be doing preparation work to ensure settlement of your claim is not delayed unnecessarily. Your claim should reach a settlement within 2-3 years as a maximum depending on complications with your injuries or the liability situation. 12. If you are not happy with your Lawyer, you can have your file transferred to another Lawyer. Generally the old Lawyer will wait for payment of his professional fees until the new Lawyer settles your claim. However, outlays paid by the first Lawyer will need to be paid out by the new Lawyer when the file is transferred. 13. An accredited specialist means that the Lawyer has completed a course and passed an exam in the Personal Injuries field. This is in addition to the area of the law being completed in the Law Degree. However 10 years hands on experience is recommended irrespective of the completion of a course. Experience cannot be replaced.